The Czech PMI dropped to 55.4 points in July, the lowest print in a year. According to Markit, the decline was partly driven by a weaker rise in output levels, but also slower growth in new orders. Delivery times continued to lengthen markedly due to the stretched capacity of suppliers. Input costs increased at the fastest rate since November 2017, but were only partially passed on to clients. 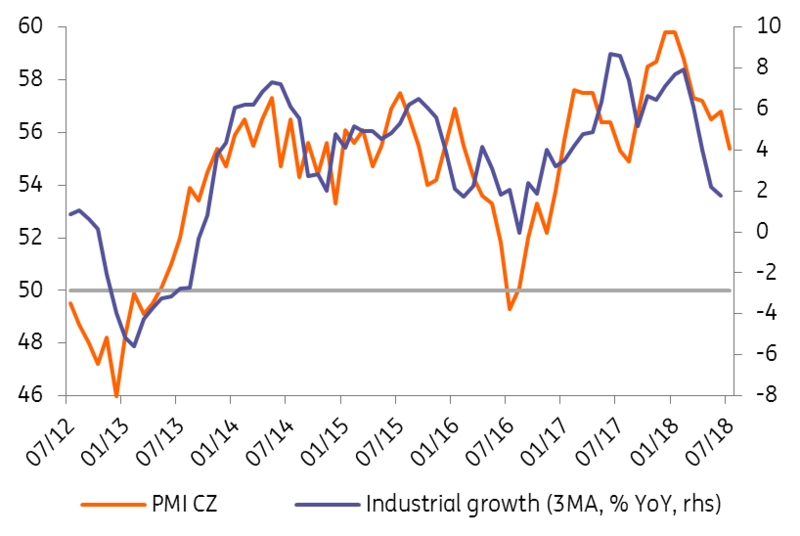 A somewhat weaker PMI in July doesn't particularly worry or surprise us for a couple of reasons: Firstly, summer months are usually more volatile; this has been the case for the last few years. For example, the PMI dropped to 49.3 in July 2016. Secondly, a weaker PMI is consistent with our expectation that industrial production will decelerate towards 3% year-on-year this year, due to a high base and limited capacity. Last but not least, German turnover in the July PMI suggests that foreign demand might improve again in the third quarter after a somewhat weaker first half.